Buffalo Stamps and Stuff is to use a stamp more than once on your card. I chose this beautiful flower stamp from Hero Arts. I stamped and embossed it with white embossing powder. 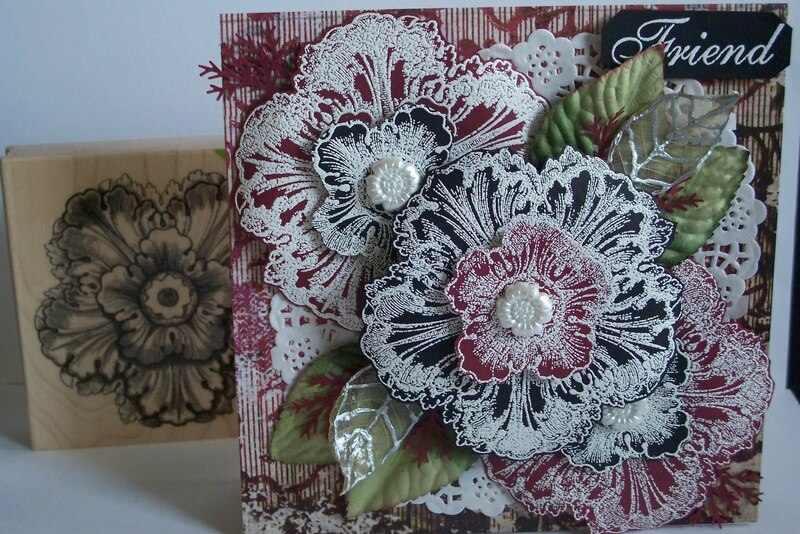 I used black and maroon cardstock to match this beautiful piece of designer paper by creative imaginations. I cut out three flowers, one black and two maroon. 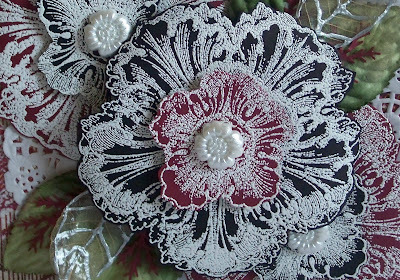 I then cut out three additional centers, two black and one maroon to pop up on the original flowers. I used buttons with the shanks cut off for the centers. the other two flowers. I added leaves from Prima and used a Martha Stewart punch to punch out the maroon fern looking branches. 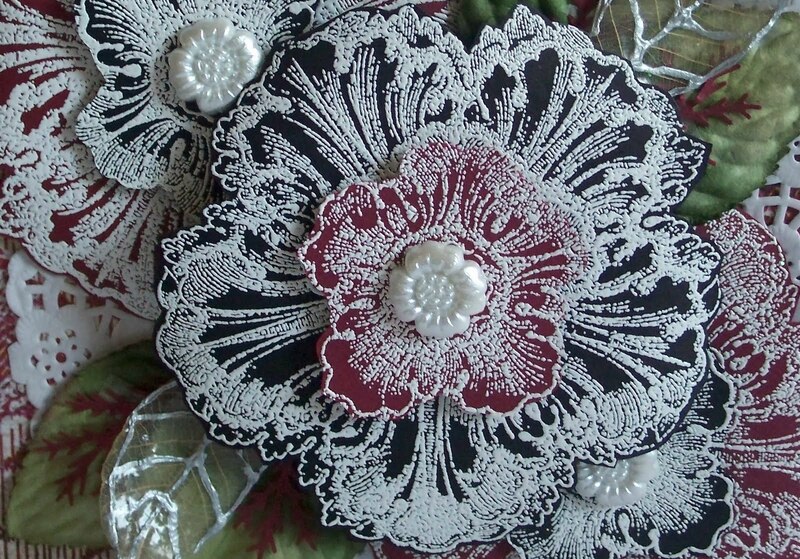 I cut a small paper doily in half and adhered it to the card stock before I started placing the flowers. I stamped the word friend and embossed with white. This is an absolutely gorgeous stamp and I can't wait to stamp it on different colored papers and embossing it with different colored embossing powders. I could see this flower on a wedding or anniversary card...awesome! Hope you have time to try using multiples of one stamp on a card. Could be something small and layered down the side of your card. Sue this is gorgeous. I love the embossed flowers and it looks wonderful in these colors. Beautiful card. It's so lacey looking. Absolutely gorgeous! That surly is a beautiful stamp and you have done it justice on your card! That is a stunning looking card. Sue, Your work is so inspirational. I get lots of ideas even though mine aren't as BEAUTIFUL as yours. Keep up the good work. Wow Sue - this is absolutely amazing! 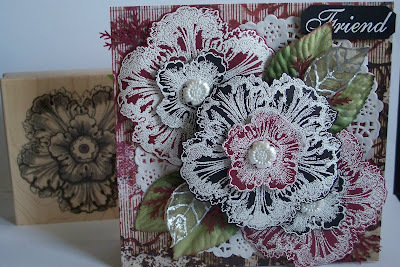 What a fantastic effect you've achieved with the embossing over the card - it is stunning!!! Sue, this is a brilliant use of white embossing powder -- I thought at first it was some of your sister's lovely embrodiery! 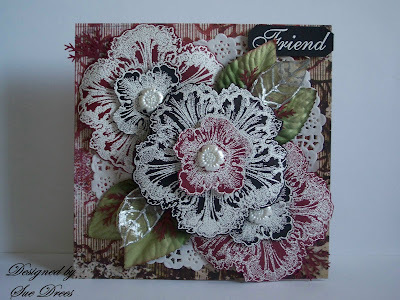 This white embossing on the flowers is just gorgeous, Sue! What a beautiful card!